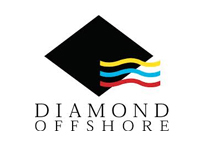 Diamond Offshore is a leader in offshore drilling, providing contract drilling services to the energy industry around the globe with a total fleet of 35 offshore drilling rigs, including two rigs under construction. Diamond Offshore’s fleet consists of 24 semisubmersibles, of which one harsh environment semi is under construction, five dynamically positioned drillships, one of which is under construction, and six jack-ups. Our mission is to exceed customer expectations and continually set the standard of excellence as we assist our customers in their worldwide efforts to discover and produce offshore petroleum resources.